Yes, the economy seems to be fit now, but you can always save yourself time and money by exercising at home. Power towers (free standing pull up bars) are one of the best ways to work your entire body from your living room or home gym. In this review, we’ll take a look at the best power towers on the market, what features to look for, and what to consider before buying. Why Buy a Power Tower? What Makes a Good Power Tower? A tower facilitates effective workouts that strengthen the abdominal muscles, back, biceps, chest, shoulders, triceps, and lower body via a dynamic range of bodyweight exercises. These workout towers, equipped with armrests, handles, horizontal and parallel bars, offer much more than pull a up-dip station; a multitude of exercises can be performed on these apparatuses. Since power towers are designed for bodyweight exercises, it requires applying force to the handles, bars and armrests to execute a range of motion in a variety of exercises, such as chin-ups, pull-ups, dips, push-ups, and leg raises. The advantage of owning a workout tower is twofold. First, it allows for an extremely effective workout via bodyweight exercises on a safe and ergonomically-designed apparatus (and is compatible with other equipment, bands, weight belts, etc.). Secondly, it allows you to utilize an assortment of upper body (and even lower body) workouts in a small space without a major time investment. Great for home or apartment use. Of course power towers are designed for bodyweight exercise use. Circuit training and a variety of interval training protocols can be used to strengthen the chest, arms, back, core, and hips/legs. Additionally, accessories such as hanging straps, weighted vests, ankle weights, dumbbells, and even kettlebells can be incorporated into power tower workouts. To maximize the potential of your workout tower invest in one that’s adjustable. Models that have fixed heights normally top out at seven feet, but people obviously vary in height. Having the option to set an optimal height, whether higher or lower, is important. It will ensure better workouts and maximize comfort during exertion. Some items to consider in regard to stability. Let’s start with non-slip grips and slip-resistant foot grips (if applicable). Be sure the one you select contains them. No one trains to get hurt! And non-slip end caps as well just to be safe. Additionally, check the load capacity of any power tower you consider purchasing. Many models can handle external weight up to 300 plus pounds (recommended), but it’s best to qualify this factor before buying. The comfort factor. To make the most of your power tower experience select a model that has well-padded armrests and a padded backrest for leg raises. attachment capabilities ̶ will give you the opportunity to train more effectually and dynamically. In general, these are durable units and should last for years. They’re constructed of strong metals and range from 85 to 200 pounds. Placing slip-resistant matting underneath a power tower is a good idea. Assembling a workout tower will take approximately two hours. Bolts, screws, washers, nuts and manual should be included. You’ll most likely need adjustable wrenches, Phillips screwdriver, flat head screwdriver, and rubber mallet to build it. Power towers provide the user with many exercise and fitness training choices that target core muscles, upper and lower body, or allow for compound/multi joint movements. Again, one of the benefits of the power towers is their relatively compact size and lightweight. It can be easily set up in a space where storage isn’t a factor or just stored away. While somewhat light, workout towers aren’t designed for constant mobility like the doorway types of fitness towers. However, moving a power tower from one place to another inside a dwelling shouldn’t cause issues. Just like a running shoe, power tower aesthetics should be very much of a secondary concern and not a decision-making factor. Power towers pair well with most gym accessories: exercise mats, resistance bands, lifting gloves, and lifting belts with chains for added intensity. Weighted vests and ankle weights are another great way to intensify your power tower workouts. This piece is great for home use because its design takes into account spatial issues rendering it easy to store in a corner of the home. Comprised of multiple workout stations, the knee raise station allows you to do vertical knee or horizontal raises for core strengthening and a dip station that enables you to train the upper body. The Marcy Power Tower TC-3508 is manufactured with a diverse set of grip handles that allows you to crucially perform exercises at different angles. These heavy duty handles can patently support your weight when using the chin up and pull up bar. In addition, its ergonomically angled VKR pads and lower foam rollers provide a means to safely strengthen your core. Highlights of this power tower are the comfortable back pad, dip handles, fold up handles for convenient storage, push up and pull up handles, and sit up foam pads. This power tower is well-suited for the outdoors. Built of heavy-gauge steel and stainless hardware, it features a lustrous finish and is designed to withstand the harsher side of Mother Nature. Its weather-protected paint boasts UV protection as well as chip and corrosion resistance in non-salt water environments, helping to maintain color vibrancy. 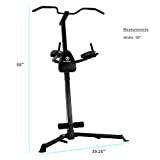 As far as the fitness benefits of the Stamina 65-1460 Outdoor Fitness Power Tower it’s capable of dropping a serious regimen on your arms, shoulders, chest, back, and core through a host of exercises such as chin ups with multiple grips, push ups, pull ups, sit ups, dips, and vertical knee raises. If installing a workout tower in a gym setting is your goal then adding the XMark VKR Power Tower XM-7617, with its vertical knee raise with dip station and pull up station, to your equipment arsenal is a solid investment. It features a split handle grip for a variation of pull up grips that allow for comprehensive upper body strength. Plus it has push up handles, dip handles, and back and arm pads for vertical knee raises. All of the handles have non-slip textured grips for gym-safety concerns. Ergonomically, the power tower offers an angled 3-inch ergonomic back pad with 3-inch arm wrests. Durability and safety-wise, it includes 11-gauge, 2 x 3-inch steel construction, skid-resistant feet and a scratch-resistant powder coat finish. The Bowflex Body Tower is designed to give the user more than 20 exercise menu options, including push-ups, squats, planks, and pull-ups, by providing E-Z adjust horizontal bars to enhance your training regimen. 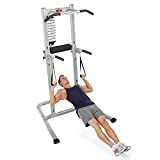 Moreover, it comes with hand grips and sling straps, adding another great stimulus to any tower workout, seemingly created with a commercial fitness purpose. 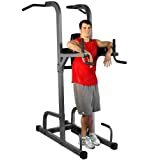 Don’t know where to start on the Bowflex Tower? No worries, a placard demonstrating eight exercises is mounted to the tower and an enclosed guide features 10 additional exercises. It has a heavy-duty commercial-grade steel base and offers a 5-year warranty on the frame and 1-year warranty on parts. Like the other power towers reviewed here, the Body Champ VKR1010 allows you to develop and strengthen your core, back, chest, and arms but at a lesser cost. It’s the no-frills version of a workout tower that can still facilitate results. Features consist of high-quality, seem-stitched comfortable cushions, non-slip grips, lightweight and simple to transport to other locations. Its protective feet ensure that your floor won’t get marked or scratched and a heavy-duty steel frame with a D-frame base supply stability and durability. XMark Power Tower XM-4432: The twin dip handles are advantageously spaced furnishing the user with a solid dip workout. It also comprises a sit-up station and adjustable padded foot bar for more abdominal exercise choices. Two and a half inch high-density cushion and double stitched, tear-resistant Duraguard vinyl round out the features. 350-pound weight capacity. Stamina Power Tower: This tower offers pull-up, dip, and push up bars, respectively. It also includes foam hand grips, knee raise supports and feet anchor points for comfort. 76 pounds. Weider Power Tower: Contains push up station, multi-grip pull up station, dip station, and vertical knee raise station. Made of durable steel tubing Weight capacity: 300 lbs. Golds Gym XR 10.9 Power Tower: Composed of a vertical knee raise station; push up station, dip station, and multi-grip pull up station that allows for wide, narrow and side-to-side grip placement. 88 pounds. 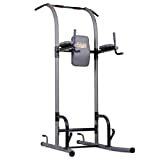 Body Champ Fitness PT600: The Body Champ Fitness PT600 Power Tower chin up/pull up station features inside and wide-grip positions, VKR station for abdominal vertical knee raises, dip station and non-slip foot grips that can also be used as push up bars. Built with a solid steel frame, box style cushions, height adjustable frame and weighs in at a super light 64 pounds. The reality is that there isn’t a whole lot of variation in the various models of power towers, however they do provide an excellent way to register efficacious workouts using the body as resistance. If you’re in a race against the clock and you have a sliver of space in that den, garage or laundry room then by all means purchase a workout tower. And the one to invest in is the XMark VKR Power Tower XM-7617. It offers a higher degree of comfort, stability, durability, and multi-functionality than the other models reviewed.